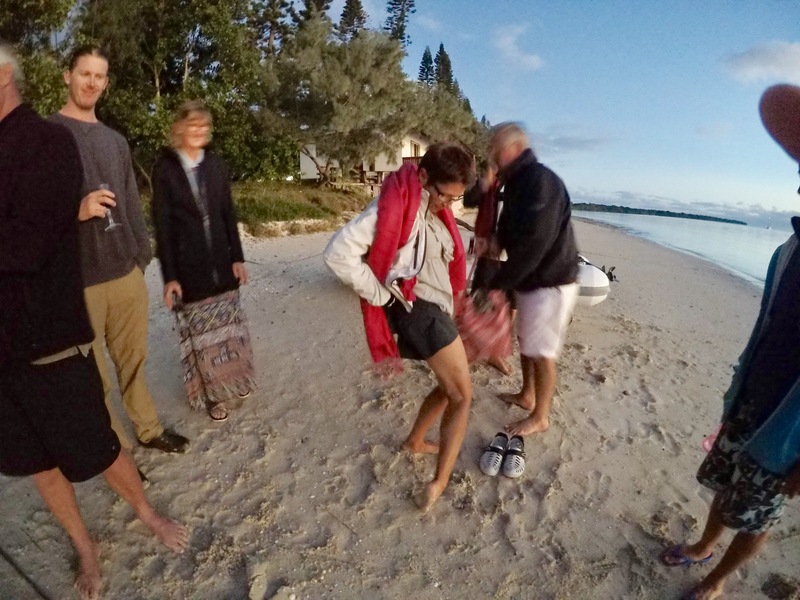 Sans Souci left Noumea headed for Baie De Prony June 14, 2017′ we stopped over at Ilot Maitre, picked up a buoy outside the resort. Frozzie picked up a buoy next to us. We went ashore for a walk around the island and checked out the resort. Bought an ice cream and headed back to the Sans Souci. We decided at 12pm to continue on to Baie Ouen, Songlines were headed there and we picked up on AIS that Bossa Nova and Easy Tiger were also going there. We had a great sail until we had to tack to Port to miss Amadee Isle, from then on it was tough going and we had to miss several reefs lying to our port side. The sea picked up and we were bashing into 20 knot winds and 2 metre seas, we arrived at Baie Ouen in the dark at 6.30pm anchored on the port side of Songlines. It was a good feeling to get the anchor down. We were greeted by Easy Tiger who invited us to share their fish for dinner along with the Bossas. It was very welcome after our 6.30 hours at sea. It was also great to catch up with them as they had spent the last couple of weeks at Isle De Pin. After a couple of nights it was time to head for Isle de Casey, took us 4 hours to get through the Chanel as we were pushing wind and tide. Arrived at 12pm and picked up a buoy, Cruising Kitty were already there. We had 5 boats from the Rally altogether. It was spectacular, had our first swim and snorkel from the back of Sans Souci. 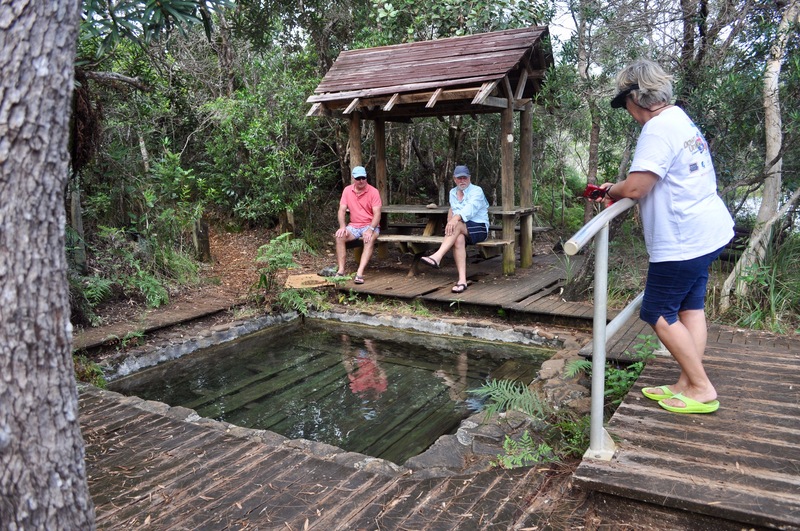 We then went ashore to be greeted by Moose who led us on a walk around the island showing us the cemetery and his water hole. Moose had been left on the island by his owners a few years ago ( he did not want to leave) , the water taxi people looked after him with food and all visitors to the island took food for him in return for a guided tour around the island. 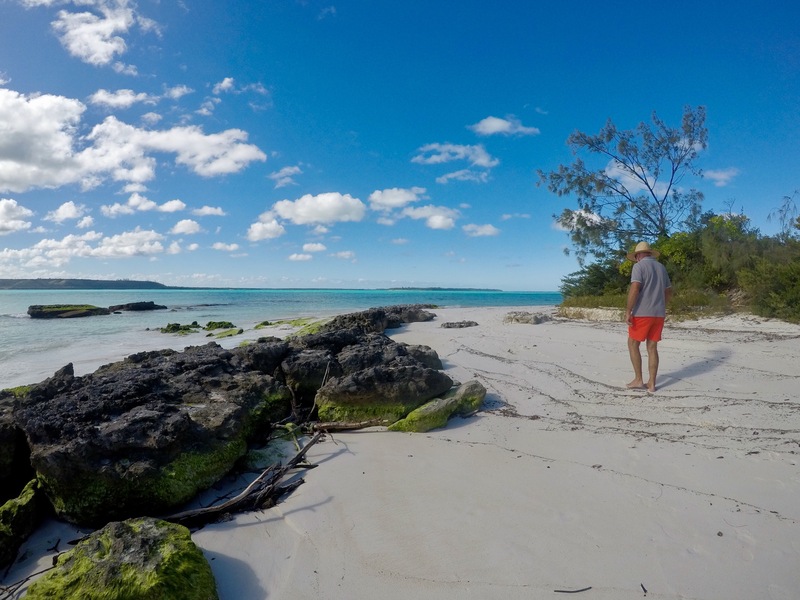 We had sundowners on the Jetty that night and the next morning it was yoga on the Jetty with our Yoga guru Leanne Hembrow ( Down Under Rally leader), then a kayak around the island, it was a perfect morning that changed very quickly when a westerly came in. We all left for Baie De Caranage, a well protected Bay from all weather conditions. Anchoring was another matter in 12-15 metres of water with lots of shoal around and very quick drop offs going from 20m to 2m. After a couple of attempts we were anchored safely along with half a dozen other boats. The bossas, tigers, kitty’s and sansoucians dinghied to the Jetty near the Prony village, dropping off our rubbish in the large bins provided at the boat ramp. We then walked to the Prony Village, a steep track which leveled out to a fairly easy walk. The Village was no longer occupied, but was kept very neat and used for occasional tours. It was once a penal colony for prisoners shipped from Paris during the uprising. Later used to house mining families when the iron ore was discovered. 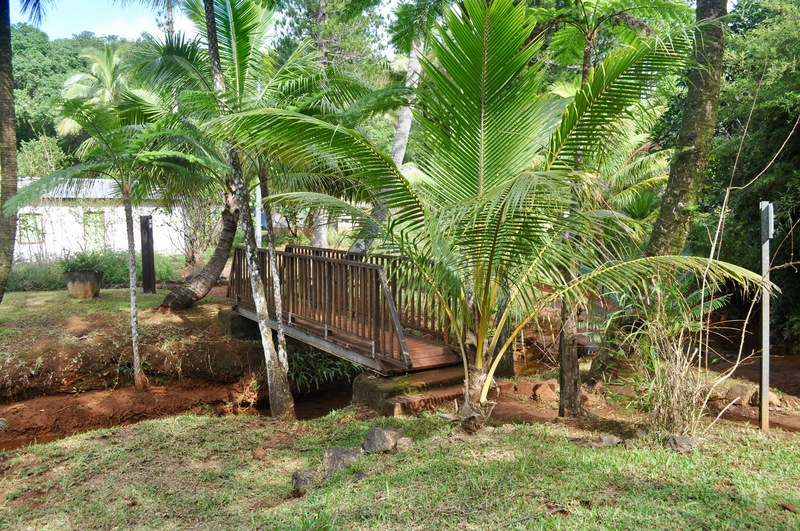 It was a very pretty Village with a lovely stream running through the middle and had a quaint bridge for crossing. Still some ruins remaining of the convicts buildings. It was back to our boats for sundowners on Bossa Nova. Had a lazy morning then followed Easy Tiger and Bossa Nova by dinghy to the hot springs which were a little tricky to navigate through all the rocky boulders caused through landslides over the years. The springs were no longer maintained as the resort on Isle de Casey has been closed for many years. It was still amazing to find something of this nature in the wilderness of a deep rocky ravine. Sundowners on Sans Souci 15 people, we had been joined by La Jorga and Zofia. It was a great impromptu night. The liver is starting to suffer a bit though. It was Amanda’s 59th birthday and a party was organized on Bossa Nova, we all took a meal to share. Neville rewarded us with his singing and guitar skills, it was a most enjoyable night with plenty of birthday cake. We were woken at 2.30am by an anchor chain being pulled up. It was Easy Tiger re anchoring. All was good. 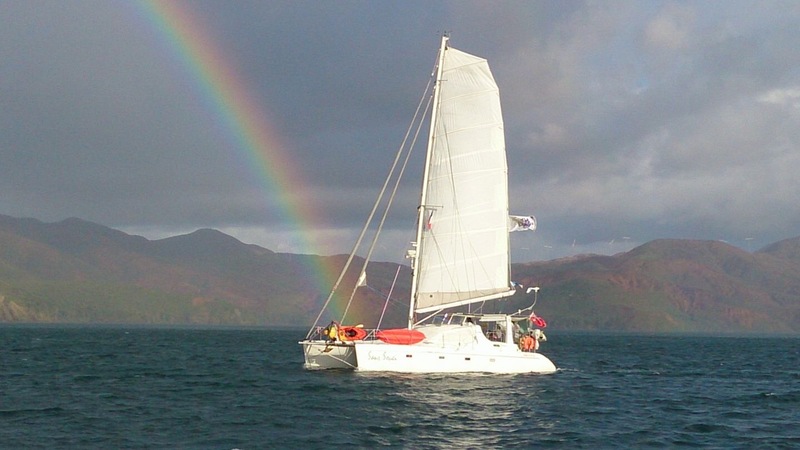 The next morning we left for Isle de Pin along with Zofia, Cruising Kitty and Squander. 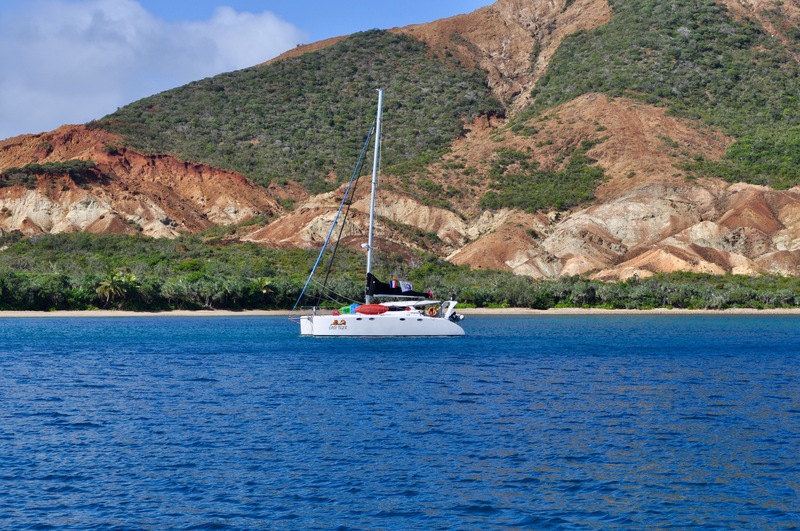 We had a great sale anchoring after 5 hours in Baie de Kanumera Isle de Pin. 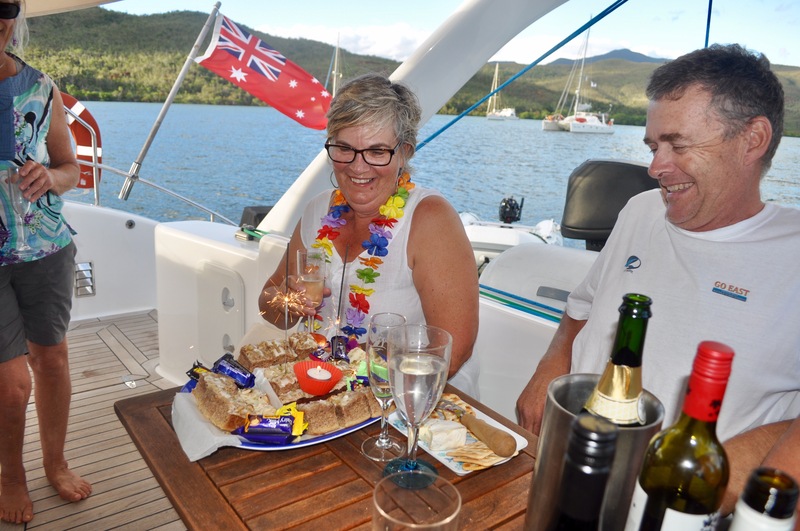 We were invited for sundowners on La Jorga followed by dinner on Cruising Kitty.Next morning we pulled up anchor it was rather rolly we had a southerly blowing in. Moved around to Baie de Kuto. I went for a walk and found the bakery along with Eva and her visitor Anna. Stocked up on a few grocery items and some nice crunchy baguettes. The local pub was closed and resorts seemed fairly quiet. 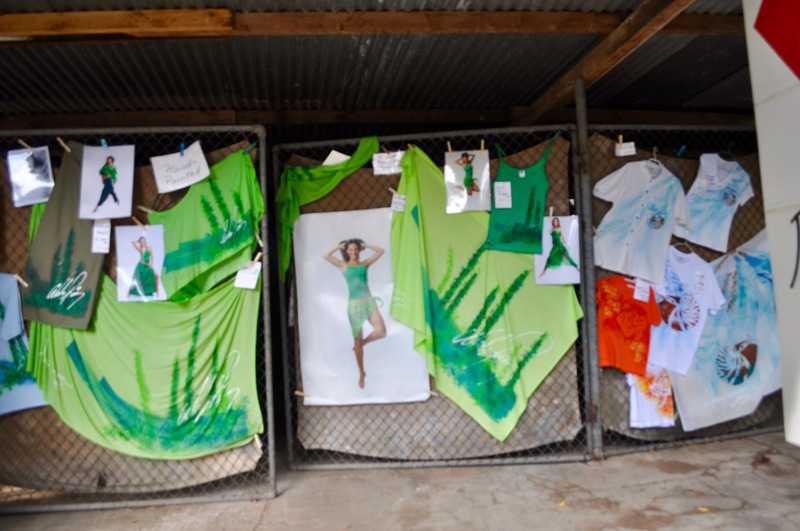 Found a small boutique selling hand painted sarongs and shirts and some old ruins that used to be a part of the prison. Next morning we took a taxi with Cruising Kitty to the market at Vao, 3000 francs which we was a bit steep. 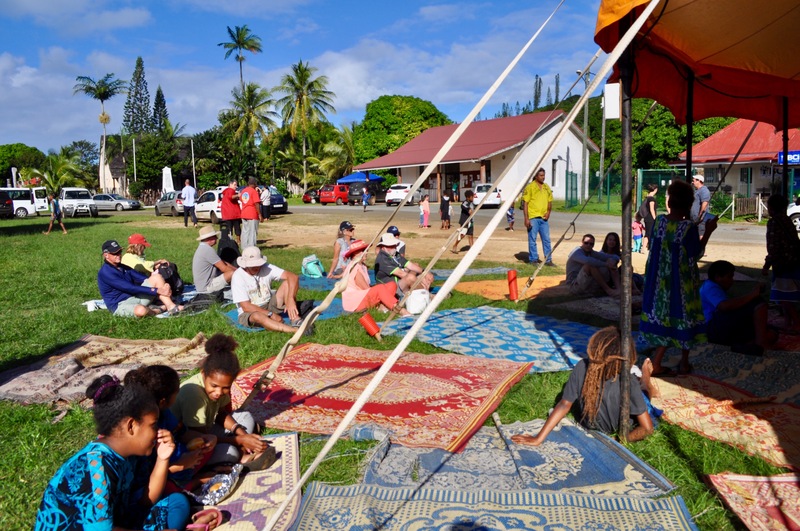 There was a music festival being held on the grounds. Vegetables and fruit were very basic, we managed to get a few items that were useful and that we recognized. Sundowners on Cruising Kitty. We booked a large taxi for 9 of us to go to Baie de Oer we were to go out on one of the KUU-ORO traditional sailing canoes on the lagoon, we were a little disappointed that the skipper did not put the sale up, however we were lucky to be going as someone important had died on the island and everyone was attending the funeral which was a large celebration. 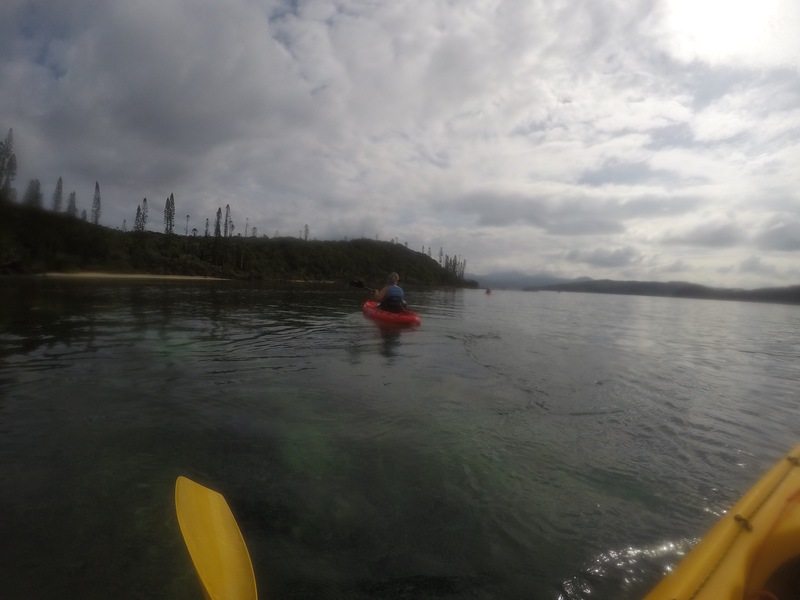 We had a snorkel around the reef it was crystal clear water and only used by the sailing canoes. 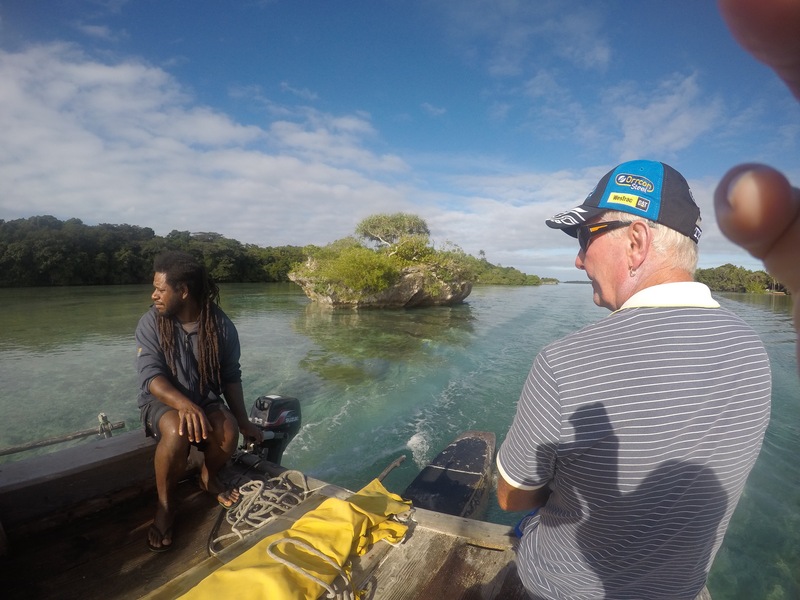 Our taxi driver then took us to the Natural Springs and dropped us with instructions to call him when we needed to go back to Kuto where our yachts were anchored. We had quite a walk to the springs but it was worth it on arrival. The springs were pristine and full of fish, we had a lovely snorkel then a walk back to the Meridian for a well deserved cocktail and French fries. We rang our driver Alex and he picked us up and took us on a tour of the airport, military cemetary and a lookout giving us an amazing view. The whole day cost us 6000 francs each including our very expensive cocktail, we had a fabulous day. 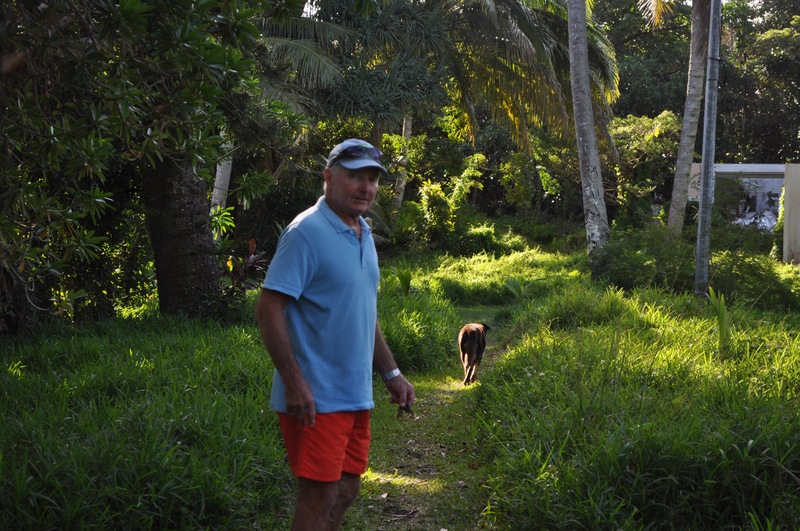 The next morning we moved on to Isle de Brosse which turned out to be a piece of paradise. We had Zofia, Cruising Kitty, Squander and Touranga turned up the next day. Spent 3 nights socializing from boat to boat, snorkeled and walked the beautiful beach. We have to keep moving, lots to see, left this morning to visit the west side of Isle de pins to a place called Baie de Ouameo it was 23 nm and we had to motor all the way. We checked out the resort and beach the next morning made a booking at the restaurant for 10 of us the next night. We had to choose between fish or beef as they had to go into Kuto for the supplies. The meat and fish were served with a traditional pumpkin and coconut rice. I didn’t mind the fish as it was Atlantic salmon the meat eaters said it was a bit tough. We had a great night a bottle of bourgelais was 2000 francs and our meal was under 2000 francs which was very reasonable. We hired a car the next day with Eva and Brian we shopped around the island heading to the bakery first at Kuto which was sold out of bread, just as well the local grocery store didn’t open till 9am, we were waiting on his door step at 8.45 am for our baguettes and further supplies. We drove around the island had a coffee at another small resort, fueled up our drums at the garage then went to the Meridian for another cocktail. Brian our chauffeur handled the driving in a very safe manner whilst hugh did all the waving to the locals as they went by. Wow, amazing places, spectacular views. Glad you are all enjoying your trip. Until next blog, drink, be merry and stay safe.